Mets Fans Turning Into Yankee Fans? The Dumbest Thing Omar Minaya Ever Said? Want To Be Even Angrier About Figgy Getting Cut? 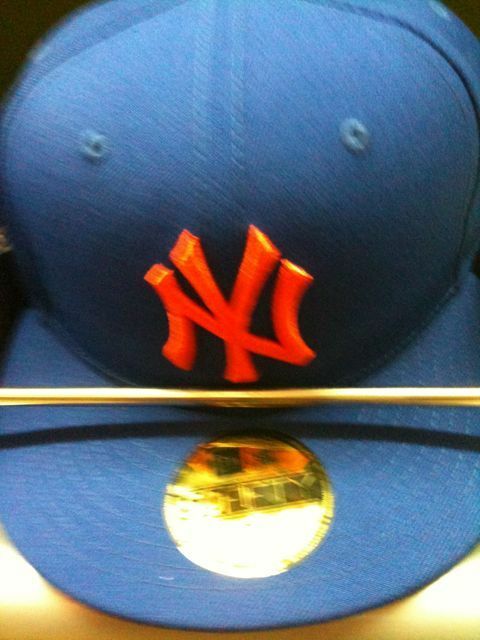 Just spotted this cap in downtown Manhattan, perfect for douchiest of Yankees fans. What legit Yanks fan would buy this??? The good starting pitching (especially BIG PELF), the good bullpen, Ike Davis, the “real” Jose Reyes (hopefully) is back…things are starting to look better than just a few days ago in Flushing and I am starting to really believe that this team has what it takes to make the playoffs. But I have something to really look forward to when I go to this Saturday’s game against Atlanta. I AM GOING TO TAKE THE FIELD WITH THE METS!!!! My Mets season ticket rep called me up with the news last week. He even gave me the option of yelling “Play Ball” on the scoreboard while being billed as the “Season Ticket Holder Of The Day” or taking the field with the team. Of course, I chose running on the field (like a Little Leaguer at a Brooklyn Cyclones game) over looking awkward on the scoreboard! Wasn’t even a split second until I figured out which was the better choice. Who cares if I’m 38 years old, this is going to be fun! I’ll have lots to report back over the weekend. But I really have to say that the Mets continued to treat me like a valued customer. Keep in mind that I have the 2nd lowest price seats in Citi Field. Saturday is also the return of “Bark In The Park” after a one year hiatus last year. The event is sold out for dogs and their owners and today’s Daily News has a story about a very special guest that will be attending: Tillman the skateboarding English Bulldog. You may have seen Tillman on TV doing his thing, he’s actually quite good at skateboarding and loves to do it. My wife and I are big fans and I wonder if they will have him skating in the Fan Fest area. A man boy can dream. Until then, I think I’ll watch the embedded video from the Daily News one more time. The booing is OUT OF HAND and I am really starting to hate my fellow Mets fans. Two nights in a row, David Wright has gotten booed for failing to get a hit with runners on base. May I remind my fellow Mets “fans” (I use the quotes because how can you truly be a fan if you are booing Wright?) that this is a sport where success 30% of the time is a good thing. Moreover, do you REALLY think booing will magically get him out of a slump? Booing Ollie Perez on Opening Day made me really angry. I have many joke at Ollie’s expense over the years and certainly have complained about him. But Opening Day should be a clean slate, past transgressions are forgotten. I guess I shouldn’t be surprised at this fan behavior considering how long the sarcastic cheers went on last season every time Luis Castillo caught a popup. While the error against the Yankees was painful, by the time August rolled around, the sarcastic cheering was beyond stale. The saddest part of the way Mets fans are behaving? You are acting just like all those obnoxious, know-nothing-about-baseball Yankee bandwagon fans that every other baseball fan hates. New York Post baseball columnist Joel Sherman takes ridiculous and unnecessary shots at Omar Minaya this morning regarding how he supposedly “mismanaged” the way in which Ike Davis was called up to the Mets yesterday. Sherman’s point of contention was that after Mike Jacobs was DFA’d and Tobi Stoner was called up as a fresh arm in the bullpen following the marathon game in St. Louis on Saturday, another first baseman was needed. A good organization would have pro-actively discussed just such a scenario, which would have triggered events Sunday night to have Davis on the first plane yesterday morning. However, Mets general manager Omar Minaya told me he did not make his series of calls to get ownership’s blessings, and to explain the plan to Jerry Manuel and others in the organization until yesterday morning. So instead of making a crown jewel’s first day in the majors easier, the Mets turned it into an obstacle course. An obstacle course? Really Joel? REALLY? The flight from Buffalo to LaGuardia takes about 1 hour and Davis’ flight landed at 2:33PM, 4 1/2 hours before the start of the game at Citi Field. Citi Field is a 5 minute drive from La Guardia and I’m pretty sure the Mets arranged to have a car waiting for Davis at the airport. That really sounds like one hell of an obstacle course! There were a few earlier flights yesterday morning but 2 of them were quite early (6 AM & 8 AM) in the morning. Perhaps Davis could have been on a flight that got into LGA 2 hours earlier but, in the end it doesn’t matter. The rest of the column goes on to describe how Davis probably should have been with the Mets since Opening Day considering that Daniel Murphy is injured and Davis had a fantastic Spring Training. Plus Sherman adds that Minaya’s reasoning for sending Davis to AAA doesn’t jive with the way the Mets have handled Jenrry Mejia thus far. Unlike the flight nonsense that Sherman lead the column with, these are valid and logical points. I am not sure if Sherman intended to tie in the flight timing to the bigger picture of the way Minaya and the Mets handle things but it came off as yet another unneccessary New York Post attack on the Mets organization. The Post tends to attack and harp on certain things with the Mets that they ignore with the Yankees. Last year, there were some construction issues like leaks in Jerry Seinfeld’s luxury suite at Citi Field that are normal in any new construction. The Post thought the leaks were front page worthy. Meanwhile, there have been cracks in the concrete ramps at the new Yankee Stadium that have gone COMPLETELY unreported by the NY Post…not even a blurb has appeared in the Post. The way the Post treats the Yankees vs. the Mets, you would think the Yankees are an arm of the Republican Party and the Mets are run by the Democrats. The Mets organization certainly deserves a good deal of criticism but for every valid critique in the media, there are 2 or 3 that just smell of piling on. Maybe Sherman needed to fill some space in his column today and he took the low road but whatever the excuse, it was an amateurish effort. Can you set the bar any lower, Omar? A 3 game sweep would be outstanding and anyone with half a brain would take 2 of 3. Anything less is simply unacceptable. The Mets are already 3-6. If they only win 1 in St. Louis, they will be 4-8. That is .250 baseball, Omar. Over 162 games that is a 40.5 win season. You would really take that? Over at Mets Police, “Media Goon” share his story about the Mets ticket office accommodating him in a requested move on his Saturday plan because he had an undisclosed problem with the people sitting next to him. I just want to add my own two cents about the great service I’ve received over the last two years from the ticket office regarding my full season tickets. At Shea, my season tickets were two seats off the aisle and right by first base in Mezzanine Reserved Sec 13, Row B. Sometime in August or September of that 2008 season, I was told I would still be two seats off the aisle and right by first base in Sec 507, Row 2 at Citi Field. Sounded good to me, I had a cheaper ticket than at Shea in a comparable location. My rep at the time in the ticket office called me a few weeks later to let me know that they toured Citi Field and realized that the my newly assigned seats in 507 were obstructed by those silly staircases that come in front of all the Promenade Reserve sections not directly above the the Promenade Club. They had told me that in a bunch of sections this is going on and they were relocating season ticket holders affected by it. The Mets were not only aware that there were obstructions in the Promenade in 2008 before Citi Field opened but they also relocated those affected by it. There was a lot said & written last year about the obstructions. But from my experience, the Mets not only were clearly aware of them, they were proactive in dealing with them. They relocated me to Sec. 514, Row 2 at Citi Field. This was literally right behind home plate and I couldn’t have been happier. Unfortunately, after we sat there a few times, we started to realize there was an issue with those seats. The design of the railing in front of Row 1 along with the ample leg room caused those sitting in Row 1 to lean forward and rest their arms on the rail. Even worse, younger kids would stand at the rail. This cause big problems for us. I’m 6′ 2″ so I was able to crane my neck or move my head to see over/around the people. But for shorter people like my wife, home plate was very hard to see. We would nicely ask the people in row 1 if they could sit back in their seat and since people have become more and more selfish and self centered, they would immediately start an argument with us. Seriously. Forget about the product on the field in 2009, we were getting fustrated with the people in the stands. We never thought to try to change our seats last season but I have a feeling they would have accomodate us. When it came time to renew for 2010, I had a new ticket rep and I made it clear to him that I was not going to renew unless I was moved to another low row in the vicinity around home plate. All payment deadlines came and went and I still didn’t renew. I kept on contact with my rep and found him to be empathetic to my situation and an all around nice guy to boot. But I held firm and waited for the dust to settle on cancellations to see what seats opened up. Finally in January, I got the call from my rep with several available options for relocation all around the area I wanted to relocate. He gladly obliged when I asked to come down to Citi Field and check everything out in person. I was able to move a few rows back and 2 sections over…and I couldn’t be happier with my location. I have a great view and right underneath my section is a mens room and great food & beer stands in the promenade food court. Oh and my rep also offered to comp me a pair of good field level seats for any non-platinum game. I am small potatoes to the Mets with my Promenade Reserved Infield tickets, the 2nd cheapest in the house but they have treated me like their best customer…and that’s what good customer service is all about. I know the Mets organization is far from perfect but some people will complain about them just for the sake of complaining or they’ll get angry at the Mets over their own ignorance and negligence. I have found the Mets ticket office to be quite responsive to my requests/needs and I know of several of account holders who have had plenty of help when they need to be relocated due to certain circumstances. If you are buying tickets from the Mets, do your homework about seat locations, build a relationship with your rep, and keep in mind this winter when renewing your plan that it behooves you to not take the first location they offer you. Better locations inevitably will open up once the renewal process is complete.